There is an excellent review of the first RHS Rosemoor daffodil competition on the Northern group website and some lovely photographs of the gardens taken by James and Wendy Akers. The Daffodils are looking delightful. 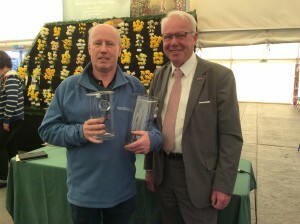 Richard Gillings won the Crystal trophy classes. Here he is after the presentation by RHS Bulb Committee chairman Jan Pennings. One of the highlights of the show was the display of over 50 species, hybrids and miniature daffodils. Many of them were hybridised by Brian Duncan from N Ireland. Visitors to the show were asked to judge their favourites. In first place N waterii, second place Minnow and Third N panizzianus . These flowers were is addition to the competition entries so I don’t think there will ever be so many different minis and species to be seen in the UK ever again.